If you’re like me, when the Xbox Game Pass was introduced a while back at $10 a month, you didn’t really pay that much attention to it. It’s not that there weren’t good games on there (there were), but they were all older and likely titles you already played through (or got for free with your Xbox Live subscription). I for one never looked into that much until they made the announcement last month that all future first party Xbox games would be on it. That was a huge game changer for myself and many others. Yes, that’s right, Xbox Game Pass subscribers now get those $60 games on release for $10 a month. It doesn’t take very long to see that if you normally purchased two of those games a year (most people do between Gears, Halo, and Forza) that it would easily pay for itself. The driver for me to subscribe in this case was Sea of Thieves, the game I’d been waiting for. I figured now was the perfect time to try it out rather than spend the $60. 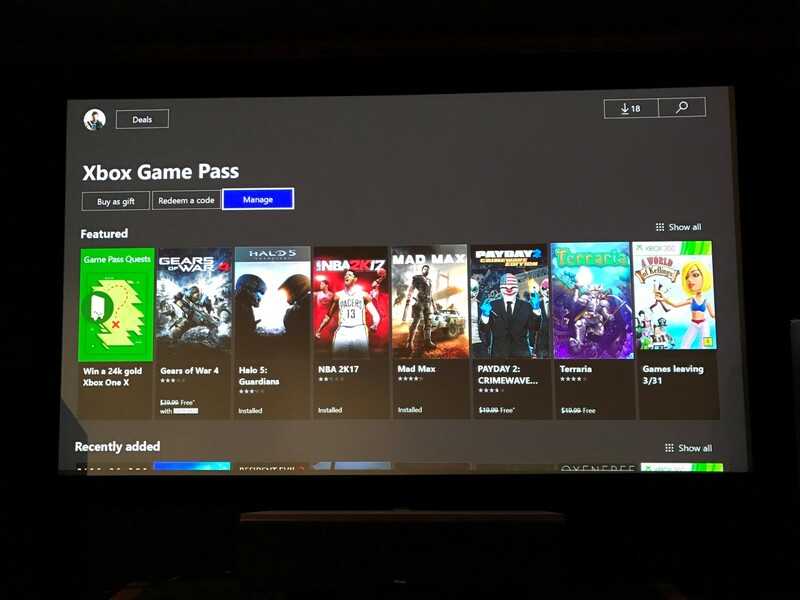 If I liked the game but didn’t like Game Pass, then I could go buy it for $60 and unsubscribe from Game Pass. Or if I didn’t like the game, then I’d saved myself $60. Ironically, I didn’t like the game that much but did like Xbox Game Pass a ton. Right of the bat, I downloaded Sea of Thieves, Super Lucky’s Tail, Sky Force Anniversary, Brothers, and Ninja Gaiden Black. It’s ridiculous how much stuff you get for $10, there’s enough there to keep you busy for a long long time. I could see though that if they didn’t add the new games you might eventually catch up on all the other games you’re interested in. Like some of the awesome games (Rise of the Tomb Raider, Halo 5, Mad Max, etc) I’ve already played through, so those don’t help me much. Others though like Super Lucky’s Tale I was going to spend $29 on, so game pass saved me a ton. Honestly, there aren’t many. I couldn’t believe how many good games there were available. It actually allowed me to start thinking about selling some of the physical copies I had because there wouldn’t be much reason to hold onto Halo 5 if I used Game Pass forever. Probably the biggest drawback is that there aren’t a huge amount of AAA titles in the pass currently. Most of the games are older or indie titles, which may or may not interest you. Probably the biggest drawback would be is if you had multiple consoles or if a big role playing game came out that consumed all of your time. In that case, you might be spending $10 a month for nothing, as you might be playing Witcher 3 all that month and nothing on game pass. You can always cancel and resubscribe though, so that probably isn’t much of a concern. There are some huge advantages. I would bet that game pass is probably going to end up saving me a couple hundred per year, as I’ll always be able to go on there and download another game when I’m bored of what I’m currently playing. That happens a lot for me, as I tend to jump around playing about 5 or 6 games at the same time in small time increments. Like Casey Powell Lacrosse 16 for example. I was NEVER going to buy that game for sure. However, would I try it out on game pass? For sure. Would that cause me to buy in the future? Possibly, if I really liked it. There are a lot of other games like that, where playing the game for free now my cause me to buy a sequel later on. So there are a lot of advantages for developers in the scenario as well, especially ones looking for exposure. Am I going to continue to subscribe to Xbox Game Pass? For sure, at least until the end of the year when I can re-evaluate what has come out and whether it has been worth it. Already though I’ve got to play a bunch of games that I previously would have never bought, so that in itself is worth a lot. Hopefully this Xbox Game Pass Review has helped you make a decision on the service. They offer a free 14 day trial, so that’s a pretty window to try it out for free before having to make a final decision. I think though that most people are going to love it after trying it out. I’m hoping that they offer a year subscription for $100 at some point, I’d totally do that, or maybe combine it with Xbox Live for one total package.